The document number is set automatically, is incremented by one when you open a new document. You can specify the number manually. Date of approve (creating) of the document. You can edit the posting date manually. For this must hold down the button with the date in the dialog box to specify the desired date. The recipient of the goods. 2. The list of goods in the invoice. 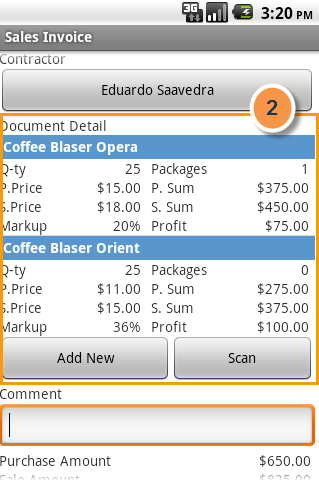 Goods is added to the invoice on the button "Add New" or by using a barcode scanner (the button "Scan"), Editor parties for sale opens . 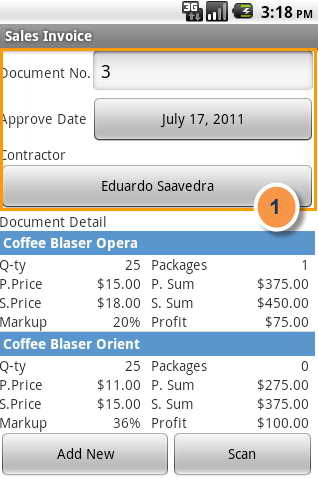 To edit or delete existing records, you can use the context menu (holding the box with the desired product). 3. The totals of the document. The amount of the purchase prices. The amount of invoice on the sale. Profit Amount on the sale. 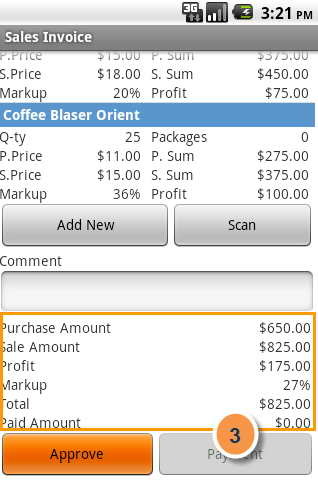 Percent of mark-up (average) for the full amount goods in the invoice. The amount paid to the document. This article was obtained through a machine translation. We would appreciate any comments. How to print a document or send it by e-mail using Google Docs.